At Mountainscapers, we want to create the perfect oasis within your outdoor space. Our landscape designs can be something elaborate and out of a fantasy to something more simple and down to earth. Our team of landscape professionals are available to make your vision come to life. One of the most amazing features we offer within our landscape design is our fire and water features. These features can take your landscape to the next level. Some of our clients like to incorporate one or the other, or maybe you want a complete balance and choose both. In our next blog series, we will be covering the benefits of water and fire features within your landscape designs. Check Out Our Water Features Here! 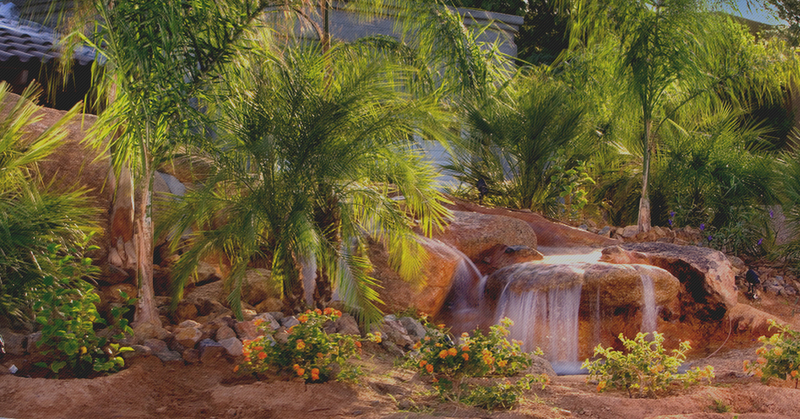 When you have a water feature incorporated into your landscape design, it brings sounds of nature to your backyard. After a long day at work, running around with the kids, or just a stress filled day deserves to be ended in a peaceful and serene area within your own home. Our water features can bring a soothing calm to an area with a nice flowing stream or waterfall. Another option is to place a constantly streaming fountain within a pool or in a seating area. The sounds of water will make you think of a simpler time while never leaving your backyard. When you introduce a water feature into your landscape design expect to see some more backyard friends. With the water features, you may begin to see more birds around your area as well as dragonflies. Your landscape will look even more natural than you intended with new creatures visiting every day. Having this new habitat in your yard can engage educational opportunities for your children, or you can sit back and enjoy the sites. If you have a smaller yard, don’t fret! Many people believe they need a lavish and large space for our landscape designs, but that is simply not the case. Our landscape designs are customized for each space, so we can implement your wants and needs the way you intended. Our landscaping team can take virtually any space and design it the way you would like and include water element features! These water features don’t necessarily need a lot of space to function. If you see an awkward space that tends to hide in the shadows of your yard, highlight it! Most of the time water features fit in the place you least suspected. While a swimming pool requires a lot of time and care to keep it clean, a water feature is much the opposite. Waterfalls, wall fountains, and anything without a pond is easy because the water just keeps re-circulating. If you have young children, this also is an alternative to a potentially dangerous pool or pond feature. Our landscaping design can figure out which water feature fits your wants and needs best. Adding one of our amazing water features to your landscape will help your yard stand out amongst your neighbors in Phoenix. Adding a water feature, whether it be a cascading waterfall to an amazing and unique water fountain, gives your yard an edge. If you have been thinking about redesigning your landscape, give Mountainscapers a call today! Check back for our next blog about the benefits of fire features in your yard!